A lot of musicians these days seem to be very sad about something. I've never been able to pinpoint what exactly makes all these talented young men and women depressed. But apparently a lot of people do know since the music industry has been churning out hundreds of bands just like Bury Your Dead. So what makes this band different than any of the others out there. Honestly, not much. 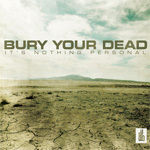 Musically, It's Nothing Personal treks no new ground. The constant flood of double bass makes the listener wonder if the drummer knows how to do anything else; the bass is hardly audible; and guitarist double picks like there's no tomorrow. I guess you could assume there's no tomorrow since the lyrics all consist of tired emo platitudes. Quotes like 'Sorrow has become my only friend again' were not particularly moving the first time I heard them. The only shining moments for the band are the few glimpses of melody in the songs. Such can be heard in The Great Demonizer and Hurting Not Helping. Singing vocals are decent but screaming cookie monster vocals seem to borrow a lot from a certain nu-metal band, Slipknot. Bury Your Dead end up in the same rut that's been tread hundreds of times before. Everything done on It's Not Personal has been done before and much better. Nothing here is gut-wrenchingly horrible but nothing worthy of praise. To impress me, all the band needed to do was make their album not sound like an obvious cash in to American musical trends. Too bad they failed at that. Bury Your Dead end up in the same rut that's been tread hundreds of times before. Everything done on It's Not Personal has been done before and much better. Nothing here is gut-wrenchingly horrible but nothing worthy of praise.